“I wonder if that tree branch will hold my weight,” I thought as I wiped the sweat off my face with my sleeve. Grabbing ahold I pulled myself up over the rock ledge. 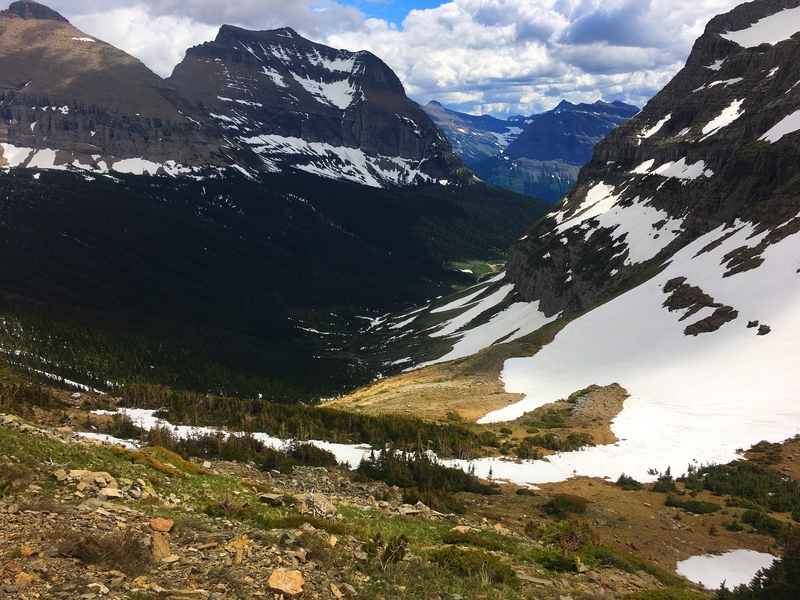 Half-way up Piegan Pass and I was bushwhacking out of fear and stubbornness. I could see the trail 50 feet away on the other side of a snow chute, but my Guthook app told me the trail crossed again just above me. I wasn’t going back across that chute. Just a minute before I had crossed that chute, my first snow chute. It was mildly steep with a good long 1000 foot snow run-out with a nice drop on to some fierce looking rocks. In retrospect, it wasn’t really a big deal (Snow crossing 101), but it had made my knees shake as I finished the crossing. I was congratulating myself on making it across when I looked back and could see the trail 50 feet up slope back from where I’d come. It was just a switchback under the snow! This was my third screwup of the day, and I was getting worried about making it over the pass and down in time to meet my wife who was picking me up at an overlook on the other side of the pass. Earlier I’d lost the trail twice. Each time I stumbled around through the snow pushing through trees trying to find the best path forward while holding my phone up to see where Guthook was telling me to go. Each of the two times I was eventually able to find the trail again, but my confidence was taking a beating and time was slipping away. So there I was, down to pulling myself up the mountain by tree branches, looking for a trail that I knew had to be just above me. Worming my way through the dense fir trees, climbing up several more rock ledges, and then I spotted footsteps in the snow. Sighing with relief, I told myself I wouldn’t lose the trail again. As I continued making my way up, I found Sketch, Stoked, and Magpie having lunch on a rock a couple hundred feet of elevation below the pass. Boy, was I glad to see them. After having lost my way three times, I decided to eat my lunch with my pack on, so I could stay close to them as we continued up crossing several more chutes and stretches of trail under snow. I was gaining an appreciation of what route-finding actually meant in practice. Climbing Piegan Pass taught me some serious lessons in route finding and decision making. The feature photo is beargrass. It’s all over Glacier National Park right now. Beautiful way to walk. BROOKLYN 5th grade Mrs. babbins class i hope to see you soon!!!!!! !